Really really enjoying although not going out for fun. Especially when you can sleep untill the sun is on your top and without thinking about to go to school in the afternoon, find parking in UCSI and walking hell far journey up to the class while the sun is hurtly burning my fair skin >.<"
That's really torturing for every students, i guarantee! 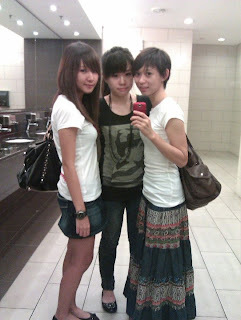 Thursday , went to Pavillion with the Sisstars after their last exam. Its been so long we never hang out to shopping together .We were looking for good food for rewarding ourself after all the hardship. Ichiban Boshi is our choice. I miss this so much.Nice one ! Yesterday Mr.Dash said i have lost weight. How can i didnt noticed about that at all ! May be we have been separated for too many days, so his judgement is unreliable. But ,it seems very hard for now. After he worked, i started to be very moody. It's the time to trained myself to hang out more with my friends. I learning and trying my best to be. Very funny of me, because i think i'm kinda hard to understand. Just like i always started a date/outing but end up i can be silence for that speak out. Dash pamper me a lot a lot a lot. He will drive whatever,whenever and However. So, when i going out with friend, i would feel the differences and this would make me feel sad. So cute of me right? But.....as i said, i trying hard to change myself and my thinking. This is a must. Otherwise i will die if and only if Dash is leaving me. My dependable bring me lots of problem. Yesterday was Dash off day. never expected much about where to hang out. As long as i can hug him tight tight and he's beside of me,that's more than enough. If myself working for 6 days and onli rest for 1 day, will I donate my time to my partner instead of sleeping? Probably i will sleep for all day long then only spend my reST of the time for my partner. I admitted, i always not a good girlfriend. But i got a good personalities. lol. Suprisingly i got no wake him up yesterday when i saw he's still in his dreamland. But ,Dash was suprisingly wake up on 12pm yesterdayyy, while i'm doing my assignment in his shop. His dad bought us famous JAWA mee from gombak. Then we eat together with his family Y This happiness is simple but satisfied. After all, he brought me to his working place, K club. The environment is not bad, the important is he got happy working there. What to do besides Movie? been left out for many good movie, Dash brought me to the nicest TGV cinema in Malaysia for movie, Wangsa Walk. Not my said, we got to know from boss. He said, this outlet cinema is the only TVG can beat the GSC cinema. Not bad.The theathre really nice, the seat is so comfortable and the popcorn is tasty. Just the ticket is about RM 13 for each. ><" APA lah?...so expensive!! Dash is in the office doing his paperwork now. He always ask me to give him some time for him to show me his achievements. but i really really really can wait him. Waiting for his big achievement and success in career. I wait you,no betray , no lies. No worries,I will fill up my loneliness into motivation.